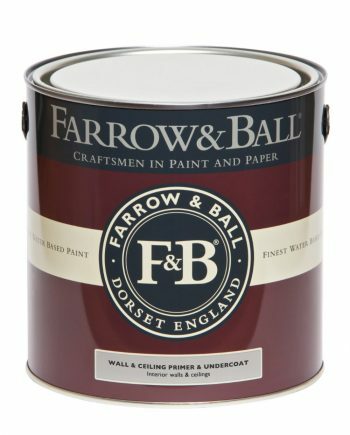 Farrow & Ball Wall & Ceiling Primer & Undercoat 5 litre is designed for use under Farrow & ball Estate Emulsion and Farrow & Ball Modern Emulsion. The product is made with the same natural ingredients and pigments as the Farrow & Ball topcoats. Use this undercoat to create a good foundation and to make sure of a rich, even and longer lasting finish. The Product is also available in a 2.5 litre can size. Preparation on New or Unpainted Plaster (Modern Construction). If your plaster is new non powdery and sound you can simply apply a diluted coat of Farrow & Ball Wall & Ceiling Primer & Undercoat. Make sure to choose the correct colour tone for your top coat (see dilution details below). Then apply two full coats of your chosen colour. If your plaster surface is powdery, flaky or unstable, first apply one coat of Farrow & Ball Masonry & Plaster Stabilising Primer to bond the plaster and seal the surface. Then apply one coat of Farrow & Ball Wall & Ceiling Primer & Undercoat. Please note: British Standard 6150:2006 recommends a typical drying time for new plaster of 7 days for every 5mm thickness. Up to 20% water for bare dry skim plaster/dry lined walls. Bare dry plaster board is up to 15% water. Patch filled plaster you can dilute 20% water. NB: The dilution rate will depend on the porosity of the surface. We recommend you test the level of dilution on a patch to determine the level of dilution required. As an alternative you can dilute the top coat with approximately 10% water. Sometimes known as a “mist” coat. Please note: When porous plasters are not sufficiently prepared, difficulties in application, variation in sheen or uneven colour may occur. Preparation on Previously Painted Surfaces. If the wall you are intending to paint is of even porosity and you are not making a significant colour change, you can simply apply two coats of your chosen colour directly to the wall. See below for the correct drying times between coats. Apply a mist coat, diluted with 10% water for uneven or highly porous surfaces. Follow this with two full coats of your chosen colour. De sure to allow the correct drying time between coats. If you are making a significant colour change apply one coat of Farrow & Ball Wall & Ceiling Primer & Undercoat, in the correct colour tone for your top coat (and allowing a minimum of 4 hours drying time between coats). Then follow with two coats of your chosen colour to promote adhesion and full colour depth. If you are painting onto a glossy or oil based surfaces, sand the surface down, then clean thoroughly with a detergent. Apply one coat of Farrow & Ball Wall & Ceiling Primer & Undercoat, in the correct colour tone for your top coat (and allowing a minimum of 4 hours drying time between coats). Then follow with two coats of your chosen colour to promote adhesion and full colour depth. Applying Paint to Walls by Brush. Ensure all surfaces are sound, clean, dry and free from dirt, grease and other contamination. Please note that flaking or peeling may occur if you paint over weak paint layers. To avoid this sand back any previous weak paint layers before you start painting. 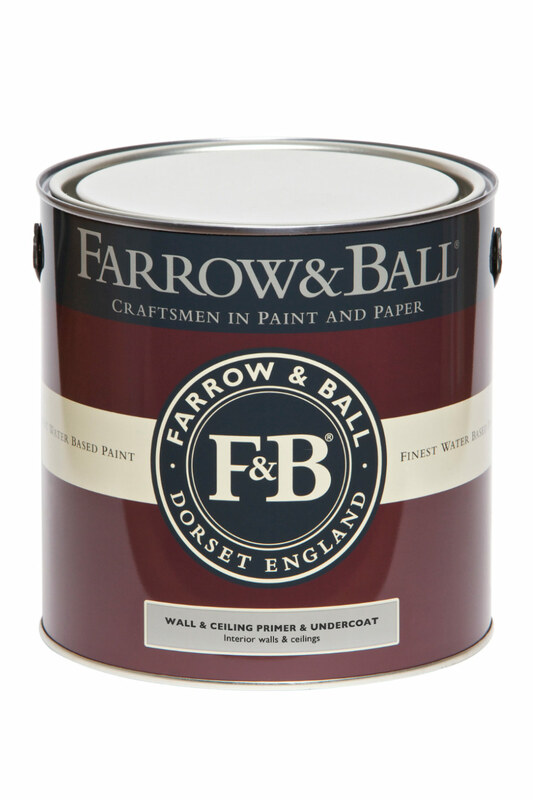 Apply Farrow & Ball Wall & Ceiling Primer & Undercoat to improve paint adhesion and promote depth of colour. Use a fine-tipped synthetic bristled brush. Apply the paint in a vertical direction and then spread the paint out evenly in a horizontal direction. Make sure to maintain a wet edge as you work. Avoid painting over cut in areas when cutting in along edges. You should first wait at least 40 minutes to avoid ‘brush dragging’. For the final coat, lay off the paint in a single direction. This will way you will minimise brush marks and brush patterning effects. Do not paint in temperatures below 10°C or above 30°C. * The drying and re-coat times provided are based on applying paint in normal conditions. Drying times may be longer in cooler and/or higher humidity environments.